I’ll admit; I probably should have been reading Kieron Gillen’s Journey Into Mystery to have a better understanding of what was going on. 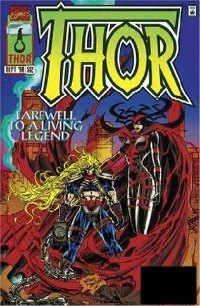 This volume collects the series’ final arc, which was a cross over with The Mighty Thor. It’s up to Kid Loki and Thor to save everyone, and tie up the loose ends of Gillen’s run on Journey and Matt Fraction’s on The Mighty Thor. Unfortunately, I picked this up completely cold. There is a lot of stuff going on that required tons and tons of Googleing to figure out. 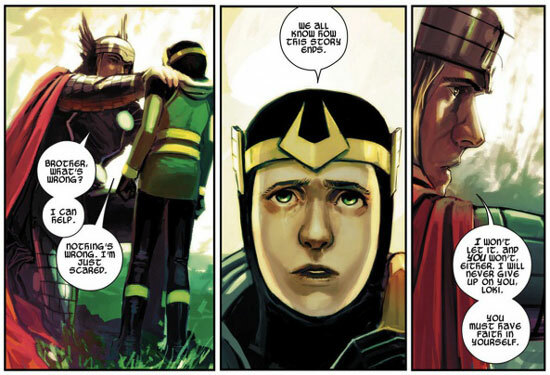 What happened–or at least what I think happened–was that Kid Loki has been feuding with the spirit of his older self all this time. And as a result, he’s somehow freed the fire demon Surtur. So it is up to him and his older brother Thor to save the universe. There’s a lot of deception, trickery and flat-out lying between all the characters, as well as allusions to some of the previous plot lines in Journey Into Mystery. All of this really confused me to the point that I still don’t have a clue as to what exactly happened. So I’m going to ask you my reader pals what happened. What I do feel comfortable talking about was how much I liked Alan Davis’ art on the Thor parts of this. He’s such a great–and underutilized–artist. But getting back to this, I’m going to say that it’s pretty forgettable unless you have been following the Journey series. If you were a faithful reader of that series, I will give it a hearty recommendation. And if you knew what happened in this, please let me know! In this issue, Silver Surfer almost let’s his altruistic nature almost take the best of him when he encounters Loki. The Asgardian’s story is pretty typical for this time. Loki really really hates his brother Thor and is always looking for new ways to destroy him. His latest plan involves using the Silver Surfer to do his bidding, with a little treachery. Loki explains to Silver Surfer that his brother Thor is a huge miscreant and is a danger to Asgard. Silver Surfer, for all the cosmic power he wields, is a bit of a rube and believes Loki’s story. The two make a deal: if the Silver Surfer goes to Asgard and kills Thor (who is planning on taking over Asgard), Loki will remove the enchantment that keeps the Surfer imprisoned on Earth. He is a god of sorts, after all. This plot really is textbook Loki logic. He has a problem that he himself can’t solve, so he manipulates someone into doing it for him. Surfer is transported to Asgard and is on a mission to kill Thor. Eventually the two meet, and Surfer attacks him as he thinks he is a liberator to the Asgardians. The whole fight sequence by John Buscema is filled with so much energy and kinetic-ism that it rivals something that Jack Kirby would have done during this period. Surfer has the advantage in the fight and realizes that Loki is doing something to not only augment his powers, but control his body. He also notices that the Asgardians are coming out to protect Thor; if he was as villainous as Loki described, no one would be doing this. Surfer confronts Loki, who does admit that this has been a more villainous plan all along and sends Surfer back to Earth as he wasn’t able to live up to his end of the bargain. Poor Surfer. He gets duped into doing Loki’s work and gets beaten up by Thor. But on a positive note, Thor wasn’t too mad at him as he knows the lengths Loki would go to in his diabolical schemes. The book ends with Silver Surfer still upset that he’s still trapped on a planet that he really doesn’t understand and had been tricked by someone he had trusted. The moral of the story: don’t help strangers. Walt Simonson on Hulk? Count me in! It’s no secret how much I enjoy Walt Simonson’s projects. This spring he is adding something to his expansive portfolio that he has never done before: been the lead artist on the Hulk series! 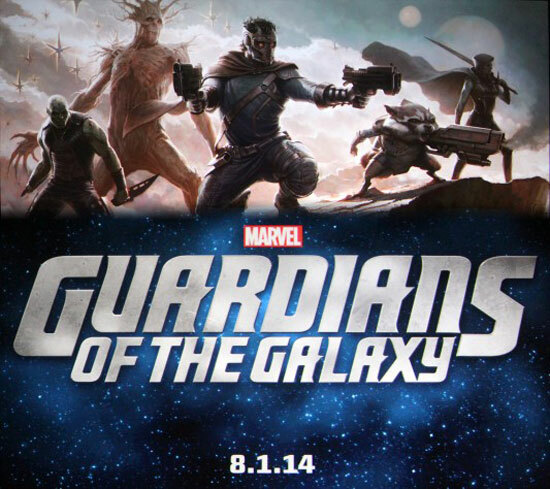 iFanboy shared this news item by posting a promo picture/teaser earlier today. Starting this April, Walt is picking up the pencil for Mark Waid’s Hulk series. 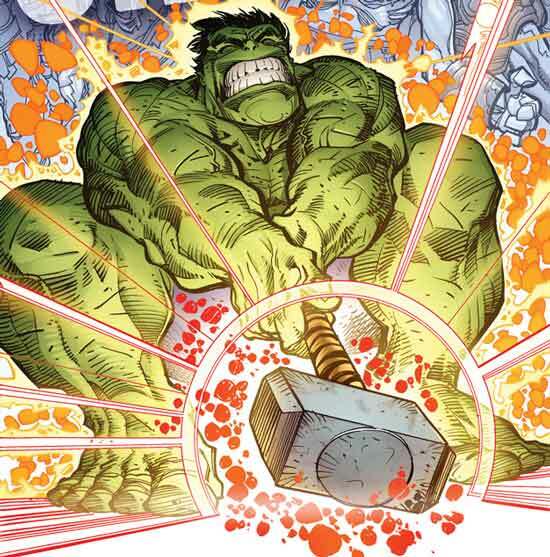 And with the Hulk trying to lift Mjolnir to little success, it seems that Thor will be playing a big role in this. Mark Waid is an awesome writer and his name on the credits pretty much solidifies it being a fun read. Walt Simonson is drawing this, which is always a great thing but only gets better being that Thor is involved. How freaking cool is that? It’s like Marvel is just trying to think of new things to make me spend my money on! I’m really debating on whether I’ll follow this as an issue or wait to get it in a collected form. Either way it’s going to be awesome, and knowing me I’ll probably willingly buy it in both formats! 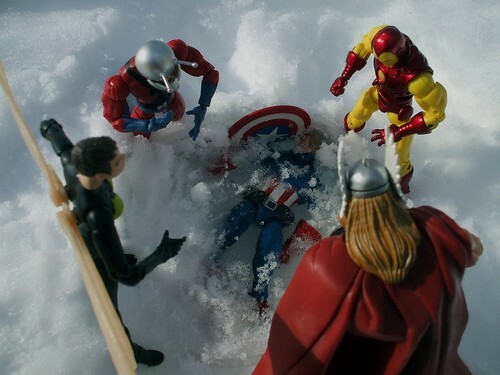 This was a fun picture I took a few years back of the Avengers finding Captain America. We were in the middle of probably the biggest blizzard/winters I’ve ever experienced; there was pretty much two feet of snow accumulated. Anyway, I wanted to take some pictures with my toys out in the snow. Having recently acquired the Wasp and the mask-less Captain America, it seemed like a fair enough idea with this picture. I really like how it turned out, but unfortunately it doesn’t really show that Cap is frozen in a block of ice! If Siege was the story of Loki’s redemption, Fear Itself is the story of Odin’s failure. So how did the All Father ruin every everything? The roots of Fear Itself go back many, many years ago, as seen in the prologue Fear Itself: Book of the Skull by Ed Brubacher and Scot Eaton. Odin has an evil brother Cul, who is the god of fear, and is imprisoned on Earth. This prologue is set during World War II, with the Red Skull trying to find the enchanted hammer of Skadi, one of Cul, which according to old folklore granted its wielder immense power. Obviously, the Nazis would have wanted that. 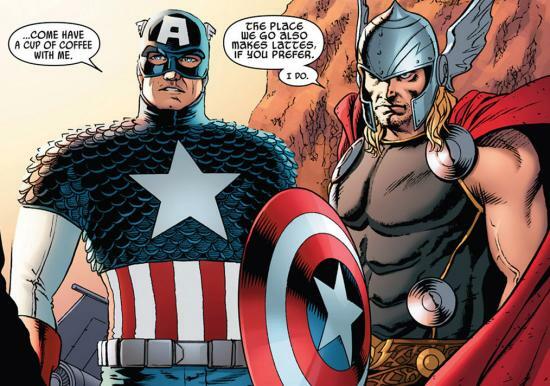 Captain America, Bucky and Namor prevent that from happening. Fast forward to the current time, and the Red Skull’s daughter Sin now wields the hammer. 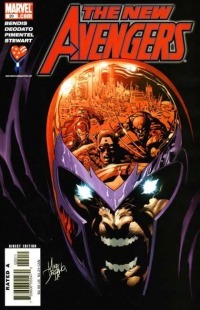 This brings us up to the actual Fear Itself miniseries by Matt Fraction and Stuart Immonen. Sin–wielding a hammer that makes her as powerful as Thor–has freed Cul. To make matters worse, Cul has armed seven random super heroes and villains with enchanted hammers as well, turning them into a group of super powered heralds at his command. With them added to Sin’s Nazi army, Cul leads a rampage on Earth before setting his sights on Odin and Asgard. The Avengers are in super trouble against Cul’s forces; Sin winds up killing Captain America/Bucky. Things get worse when Odin reveals his plan to destroy Earth as a way to stop Cul. It only gets more complicated as Odin further explains that there is an ancient prophecy that the only way to stop Cul will leave Thor dead. 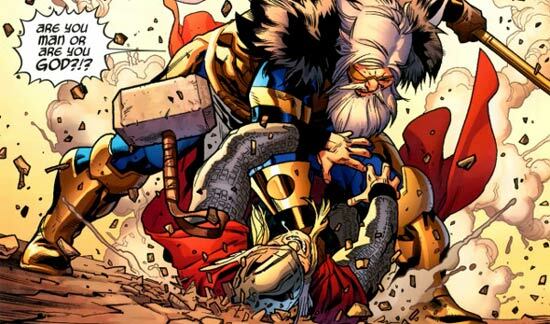 Odin would sacrifice mankind if it meant Thor would survive. Fraction’s story depicts Odin as a cowardly old man. He may be the ruler of Asgard and one of the most powerful inhabitants of the Marvel Universe, but he’s petrified. His son Thor isn’t, and is willing to give up his own life if it means that Earth is safe. Even Iron Man sacrifices his integrity–in his case,his sobriety–in an attempt to offer something as a sacrifice to Odin for help. Because Thor is a hero, I’m sure you have an idea how this winds up ending. What I liked about this story was how much of a hero he is, being even braver than Odin. the only thing that I didn’t like was them killing off Thor, since they did a whole world without Thor story a few years back after Avengers Disassembled storyline, and Bucky, because I was really enjoying him hanging around. But thanks to the flexible condition of death in comics, they came back not too long after this. 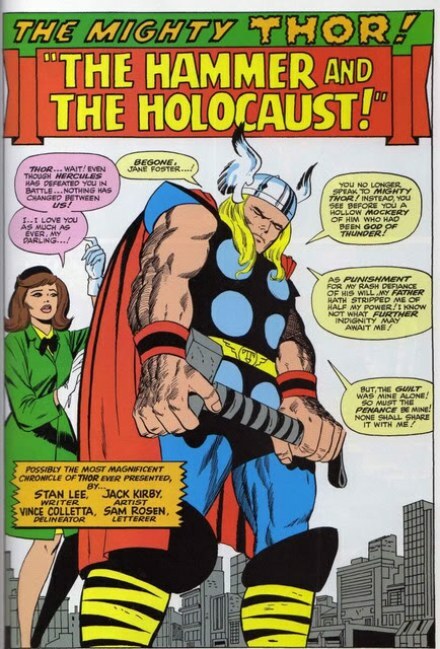 THOR DOESN’T LIKE PEOPLE SAYING VINCE COLLETTA DELINEATED HIM. If you know someone who likes the Avengers, stop by your local Disney Store. They’ve teamed up with Diamond Select Toys for an exclusive line of Marvel Select figures featuring the Avengers! What’s so special about them? 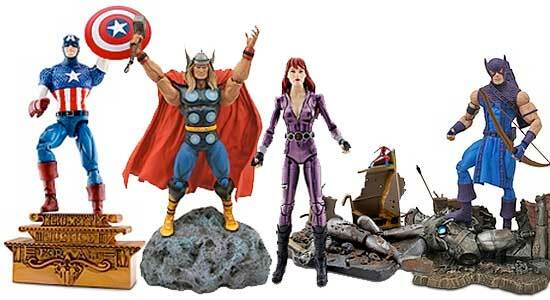 Marvel Select is a line of high end collector action figures that are super detailed. This line features four Avengers who were heavily featured in some of the recent Marvel films wearing their classic gear. They also come with really elaborate stands and backdrops. Thor can stand victoriously on a huge boulder and Captain America comes with a base and background to recreate the iconic John Cassady cover. They hit it out of the park with the Black Widow and Hawkeye figures. Not only do they come with a base of building wreckage and a dismantled Ultron, but they come respectively with a tiny version of Ant-Man and Wasp! The detail on Wasp is amazing; she’s sitting on an arrow! One of the best things about going to comic book shows is getting sketches from artists. Not only do you wind up getting a unique piece of art, but its a great opportunity to talk with your favorite comic creators. 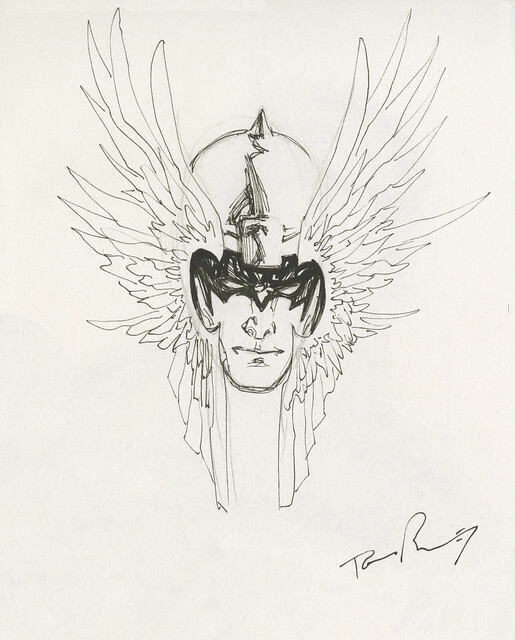 I’m going to share the story of my first comic sketch, and how it wound up being Nightwing wearing Thor’s helmet. I remember it like it was yesterday; it was Wizard World’s Philadelphia show in 2004. At the recommendation of a friend, I set out to get sketches. The first stop was Tom Raney who was signing and sketching at the DC booth. I was a fan of his then-current work on Outsiders, as well as his previous work on Thor. As I waited online for a long time, I started wondering what sketch I would ask for. After all this was very important; it’s my first sketch. I decided that I wanted a Brother Blood sketch; after all he was a prominent villain in the first couple issues of Outsiders. Before I knew it, I was next in line and then things got weird. I’m going to write this out like a script so you can get the full effect. Raney: (finished signing everything) So what would you like a sketch of? Me: Brother Blood would be awesome. Raney: Do you have a reference? Chris did those issues. Me: (mutters something intelligible and feeling really awkward) Ahh….could I get Nightwing wearing a Thor helmet? And then Tom crafted the above sketch, which is just flat out awesome! It was very nice of him to do something that was so ridiculous. And that’s how I got my first comic sketch. You can see more of his work at his blog or his DeviantArt. Brazil can lay claim to being the home to the samba dance, the capoeira fighting style, Max Cavalera and his thrash metal bands Sepultura and Soulfly, and Mike Deodato, who happens to be one of my favorite comic book artists. One of the things that separates him from his peers and puts him closer to artists like Pablo Picasso and Jackson Pollock is that Deodao has distinct phases of his career. If you look at his work from the 1990s, it really fits the Image Comics style that was all the rage. There is a strong influence of Jim Lee, especially in the way he constructs his figures. On the clothing side, he takes some fashion tips from Rob Liefeld in his designs. Some people think that this part of his carer, although good, is dated. I don’t agree with that. There is a certain amount of motion and detail in his work from this period that will always stand out. Some of his best work from this period is the “Worldengine” story in Thor with Warren Ellis. His versions of the Asgardians and their world were breathtaking. He also had a really good run on Wonder Woman with William Mesner-Loebs. 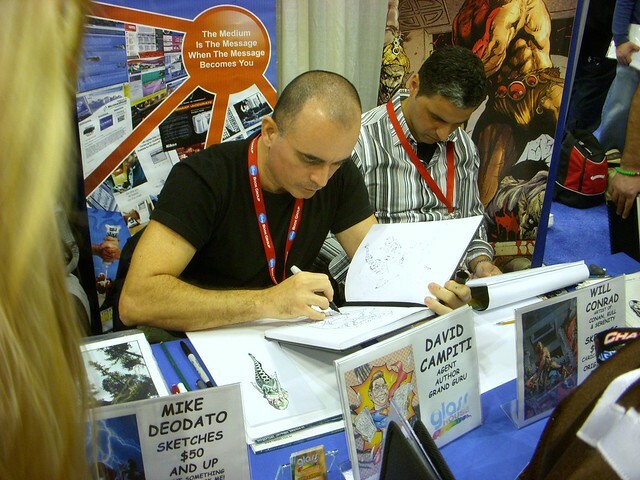 Deodato seemed to have disappeared from the comics world for a while and came back to Marvel with a vengeance in the mid 2000s. His new/current style involves a lot of negative space and shadows, creating a dark and moody environment for the characters. Even the way he draws people has changed, going to a much more photo-realistic style reminiscent of Brian Hitch. Primarily he has been working on Avengers related books, like New Avengers, Secret Avengers and Thunderbolts, and even had a really good run on Amazing Spider-Man as well. This new style debuted on a run of Incredible Hulk with Bruce Jones, which was more espionage than action/adventure. This new look was perfect. For more information, pictures of some of his recent work and art sales, visit Glass House Graphics. Super Hero Fun At The Jersey Shore! 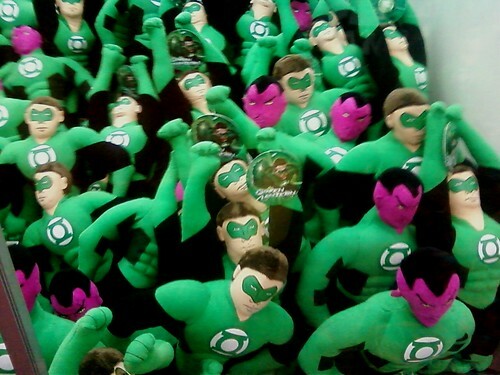 Nothing says summer fun like Green Lantern and Sinestro plush! As part of the Fourth of July festivities, my girlfriend and I went to Jenkinson’s Boardwalk in Point Pleasant Beach, NJ. There is lots of fun to be had at the Jersey Shore, even if you are me and would rather read comics than go out clubbing with the Situation. That confused, classy lady with the Kate Spade handbag is not only a master of the skill claw but my girlfriend. The boardwalk amusement games were filled with stuffed animals, Sponge Bobs, and flocks of Angry Birds. But things got comic-y really quickly. There were giant stuffed Green Lanterns everywhere. There was even a skill crane filled with plush Hal Jordans and Sinestros. I can see lots of kids begging their parents for another dollar so they can win a stuffed Green Lantern. Who I feel bad for is the child who winds up getting Sinestro–in a Green Lantern suit no less. He or she would probably have that same sad, defeated look that Ralphie had that Christmas morning when he was forced to put on the bunny suit. 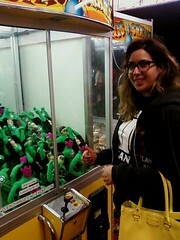 Me, on the other hand, unsuccessfully attempted to win a Sinestro to impress my lady friend. She was more interested in hitting up the 1990s Addams Family movie themed pinball machine in the back. Who has two thumbs and a stuffed Thor? This guy. So after some ice cream, I decided to challenge her to a game of air hockey. Even though I started the game pucks-a-blazing like the Sedin twins, she did her very best Tim Thomas impression, crushing my hopes of winning like the Boston Bruins broke the collective heart of the city of Vancouver. So to make me feel better, the girlfriend vowed to win me a prize by the end of the evening. 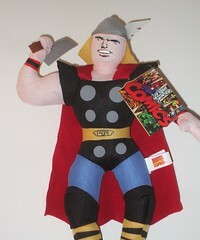 Without fail I wound up getting this really cool stuffed Thor. Looking for something to read at the beach? I was asked to put together some recommended comics that are suitable for an adult audience. Here is a list I put together, including four based on recent superhero movies and four that have nothing to do with super heroes. If you went to the movie theater this summer, chances are you’ve seen that Hollywood has been making movies based on comic books! Comic books (or their more sophisticated cousin the graphic novel) are not just for kids. In fact, most comic books are written for adults! Not only that, but story wise there is much more to comics then just super heroes! Here are some great books that were the basis for some of this summer’s biggest movies, as well as some of the most popular graphic novels on the shelves! 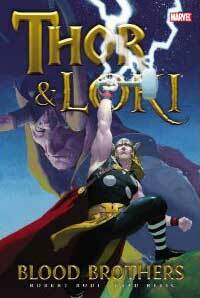 This cautionary tale shows family dynamics of the godlike brothers Loki and Thor from this summer’s blockbuster. Showing their lives infancy to adulthood, Loki is constantly reminded of his inferiority in comparison to his brother Thor, as well as not being able cope with the utter disdain his father Odin has for him. These strained relationships show give a glimpse on how a lifetime of sadness and self-doubt created a rift between the brothers. After three beloved pets are abducted and forced to become military weapons, all they want to do is return to their human families. When they find out they are going to be “decomissioned” (destroyed), they set out on a perilous journey to survive. Morrison created three extremely sympathetic characters, that remind you of your childhood pets. The book may have limited dialogue, but Quitely’s innovative page design and stunning artwork will fully capture your imagination. Green Lantern made his movie screen debut this summer, but this story from 1970 is his most compelling adventure. With his more socially conscious friend Green Arrow at his side, the typically space faring but somewhat naive Green Lantern goes on a cross-country journey of self exploration through Vietnam War-era America. Along the way, the pair encounter racism and bigotry, drug abuse, sexism and discrimination, and corruption; all subjects not typically shown in comics at that point. Based on a true story, this graphic novel shows the life of four lions trying to survive their escape from a war-torn Baghdad Zoo in the early 2000. Much to the chagrin of the other animals, Zill feels that his pride can only survive by leaving the gutted zoo. By humanizing all of the zoo animals, a story is an examination of the role off family and the cost of freedom. Did you ever wonder what it would be like if your favorite fairy tale characters were real? Willingham explores this topic in the Fables series. The fairy tale characters you grow up with live amongst in Manhattan’s Upper West Side, dealing with real world situations like the nasty divorce of Snow White and Prince Charming due to his infidelity, the now human Big Bad Wolf trying to redeem himself for the transgressions of his youth, and even the strained father-and-son relationship of Gepetto and Pinocchio. Each part of the series is different in subject matter, falling into genres like crime, mystery, romance and even political suspense. As seen in X-Men: First Class, the superhuman Magneto is a Holocaust survivor and this book tells the story of how he–then a teenager named Max Eisenhardt–loses his family and barely survives. All elements of super heroics are stripped from the character, leaving a compelling narrative. The art is moody and dark, creating a sense of drama and sorrow. The book also features a powerful short story by comics legends Neal Adams and Joe Kubert, chronicling the life of Auschwitz prisoner Dina Babbitt, whose artistic talents were exploited by Josef Mengele in exchange for him guaranteeing her and her mother’s safety. This ongoing series chronicles the most recent adventures of Captain America, from the return of his long assumed dead sidekick, to him facing and overcoming his own mortality. Filled with espionage and mystery, as well as dealing with themes of personal loss and adapting to an ever-changing world, Brubaker creates an intriguing take on one of America’s most iconic characters. Zombies have taken the spot of vampires as America’s favorite supernatural creature. This series is less about monsters and horror, as it revolves around small town sheriff Rick Grimes and the community he protects, trying to find a way to survive in a post apocalyptic world. This has been adapted to a popular television series on AMC. These and other great comics can be found at your friendly neighborhood comic book shop. Don’t know where you can find one? Go here or call 1-888-COMIC-BOOK. If you can’t find one, try your local library or one of the fine book retailers in your town or online. In watching the post-NBA Finals landscape, the big topic isn’t necessarily the impending lockout or even the greatness of Dirk Nowitzki and the Mavs. The discussion is instead dominated by LeBron James. For many sports fans, mocking LeBron’s lack of a championship is cathartic. It’s payback for the never-ending free agency speculation, the Decision primetime special, the un-likability of the current Miami Heat roster, and even the seemingly overexposed media presence he’s had over the last decade. Not to mention, he hasn’t seemed to gracious in defeat. More than anything, at this point LeBron in his career, he parallels a super hero. 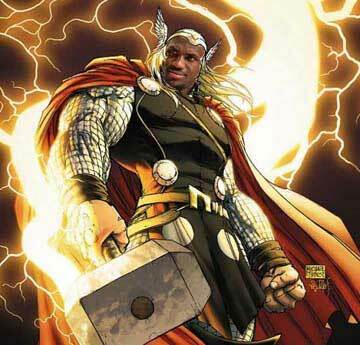 LeBron is Thor. These two larger-then-life figures have more in common than you would think. Look at their lives. They have both always been viewed as the heir apparent, whether it is to become the face of basketball or the king of Asgard. They’re both unbelievably good at what they do, and because of that, they have the ego to match. When the Heat’s big three joined forces, it was clear that LeBron would be the most scrutinized—and had the most to lose if they did not win a championship. Dwayne Wade already had one from 2006, establishing his legacy and claim of greatness. Chris Bosh was just lucky to be in the situation. If you continue this Avengers metaphor, Bosh is totally the Ant Man of the Heat. He’s just there. He helps out when called upon, but doesn’t dominate the team. Occasionally, he has his big moment, but he’s just a supporting character. As LeBron’s legend grew, he had his victories and his defeats. He—deservedly—is a two time MVP. In 2007, he led a Cavaliers team to the Finals due to his sheer will. Ultimately, that team, like the Heat lost. Unlike Thor, LeBron James is human. There is only so much he can do. Clearly, LeBron takes this all too seriously. His frustration is evident. He wants to win so bad he was willing to leave his home, where he was viewed like a god. His competitiveness has made his somewhat bitter, as he’s lashed out in the media with certain foolishness. Remember this quote from when the Cavaliers were eliminated in the 2009 Eastern Conference finals? It takes a real man—a real leader—to know that accepting your defeat is not a sign of weakness. This next bit of arrogance came out again just a few days ago. Again, he doesn’t show strong character in defeat. He still hasn’t learned. LeBron is at a crossroads, just like Thor. For brevity’s sake, we’ll simplify his story as it was shown in the movie this summer. Thor is brash and cocky. To teach him the lessons of humility, Odin strips his son of his powers and banishes him to earth. Thor can only reclaim his position of celestial nobility once he was able to overcome his hubris. Losing the NBA Finals and his subsequent reaction has put LeBron in this situation. He’s been vilified and his integrity has been doubted. If he wants to return to being viewed as the beloved superstar he was just a little over a year ago, he has to swallow his pride and show that he can take his criticism in stride. When he regains his humility, only then will LeBron be able to wield Mjolnir. Or in his case, become a deserving NBA champion.